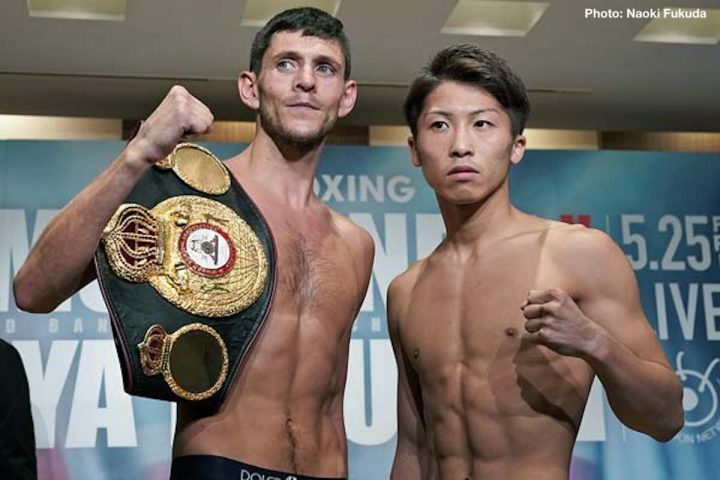 By Trevor McIntyre: WBA World bantamweight champion Jamie McDonnell (29-2-1, 13 KOs) successful weighed in at 117 ½ pounds on Thursday for his title defense against former two division world champion Naoya Inoue (15-0, 13 KOs) for their fight this Saturday night at the Ota-City General Gymnasium in Tokyo, Japan. The 25-year-old Inoue weighed in slightly heavier at 118 lbs. This will be #2 WBA Inoue’s first fight at bantamweight, as he’s moving up from super flyweight where he held the WBO 115lb title. McDonnell, 32, says he plans on entering the World Boxing Super Series bantamweight tournament, and winning it, making lots of money and then retiring. McDonnell’s chances of beating Inoue on Friday aren’t so good. He’s expected to lose to the Japanese fighter. Whether the WBSS organizers will want McDonnell in their tournament with him coming off a loss to Inoue remains to be seen. But you would have to believe that even if they do allow McDonnell in, he’s not going to win the tournament. If the 5’10” McDonnell gets in the WBSS tournament he would need to beat the likes of Inoue, Ryan Burnett, Emmanuel Rodriguez and Zolani Tete. It sounds like a pipe dream on McDonnell’s part in talking of winning the WBSS tournament. I mean, it’s good to have ambition and goals for oneself, but McDonnell’s dreams a little too lofty. Instead of hoping to win the tournament, McDonnell should be hoping he wins on Friday night against Inoue, because that’s his immediate goal – beating Inoue. If McDonnell gets past Inoue, then he can start thinking of winning the WBSS tournament. The Japanese talent Inoue, who goes by the nickname, ‘Monster,’ has been awfully good since turning pro in 2014. Inoue has captured world titles at light flyweight and super flyweight. He probably could have won a world title if he had entered flyweight division and gone after a belt in that class. Instead, Inoue skipped the division and went from 108 to 115 in 2014, beating World Boxing Organization super flyweight champion Omar Andres Narvaez by a 2nd round knockout. In the last five years, only one fighter has gone the distance with Inoue and that was the tough as nails David Carmona. Inoue beat Carmona by a 12 round unanimous decision. Carmona (21-5-5, 9 KOs) will be fighting this Saturday night against WBA World super flyweight champion Kal Yafai (23-0, 14 KOs) at the Save Mart Arena in Fresno, California. It’ll be interesting to see how well Carmona does against another world champion. The 5’5” Inoue will need to overcome the 5” height advantage of the 5’10” McDonnell for him to have a chance of winning on Friday. It won’t be easy for Inoue to do that because McDonnell likes to use his height and reach to box his shorter opponents. This will be McDonnell’s seventh defense of his WBA title. Jamie McDonnell, he expects to win. It’s not a fight where he’s thinking ‘I’m going to give it a go’. He believes that he’s the best bantamweight in the world,” trainer David Coldwell said to skysports.com. McDonnell plans on staying at 118, win or lose on Friday night. It’s difficult to imagine McDonnell wanting to fight on if he gets beaten by Inoue, but perhaps he feels he can beat one of the other champions at bantamweight. I’m not sure that he can, but you can’t blame him for wanting to try. McDonnell will need to wait a while until the World Boxing Super Series tournament is over before he gets a crack at one of the bantamweight champions if he gets beaten by Inoue.